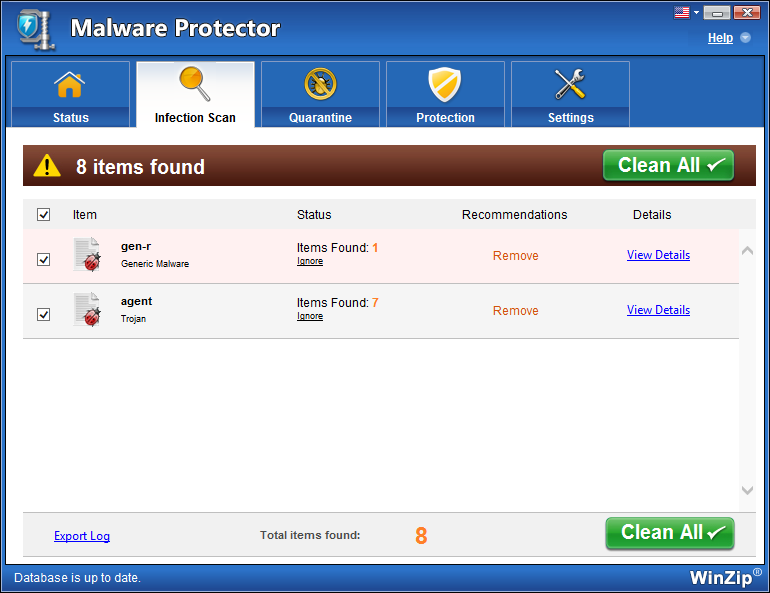 Malware Protector scans your PC for malware infections such as adware, malware, password stealer, rouge program, browser hijacker, monitoring program, Trojan, key logger, etc. To get started, select the type of scan you want to perform and click on the Start Scan Now button to initiate scanning process. During the scanning process you will notice your PC is being analyzed. At any time, you can choose to abort the scanning process by clicking the Stop Scan button. Once the scan is complete, a list of malware infections detected on your PC is shown in the results, with details such as the malware name and its file path on your computer. By default, malware infections are selected to be removed. Uncheck the box to un-select the infections that you do not want cleaned or removed. Please note that any infection that is unselected or left behind, may impact the final result of the cleaning and your overall PC health. Corresponding to each detected infection, you will also see the View Details option, which you can click on to access more information about the respective malware item. View Details option brings up a new window that details each and every infection found under that respective categories. When you are done reviewing the results, click on the Clean all button to start the removal of infections, resulting in an infection free, smooth and stable computer. Note that Malware Protector automatically creates a System Restore point before the cleanup and then permanently removes the selected malware infections from your PC. Malware can cause unexpected and unwanted activities on the system, which is why we recommend cleaning them out frequently. How do I reinstall Malware Protector on my PC? How do I upgrade to the latest version of Malware Protector?